Science Club provides an opportunity for students in grades 3-6 to participate in an after-school Science Club. The Science Club is designed to be an adventure for the students and a learning opportunity for a classroom teacher. Activities are aligned with the Science and Engineering Practices as outlined in the Next Generation Science Standards (NGSS). 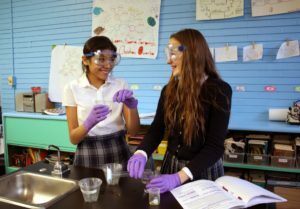 By asking questions, making observations, creating models, and conducting investigations students hone their scientific skills that foster critical thinking. As part of their hands-on investigations, students practice constructing explanations, collaborating with others, and communicating findings. Robotics Club This club gives participants the opportunity bring their coding skills to life through a variety of challenges posed to code their very own robots! Through the use of our Dash and Dot robots, students are able to put their creative skills to the test and watch the robots learn to perform a variety of tasks that students pose. This club is a big hit with students of all ages! Choir Director, Mrs. Dychiy, attended the College of Music and Pedagogical University in Ukraine. She completed her studies at Louis University and Dominican University. She is the Music teacher for all grades and the Director of the School Choir, which sings the Divine Liturgy. 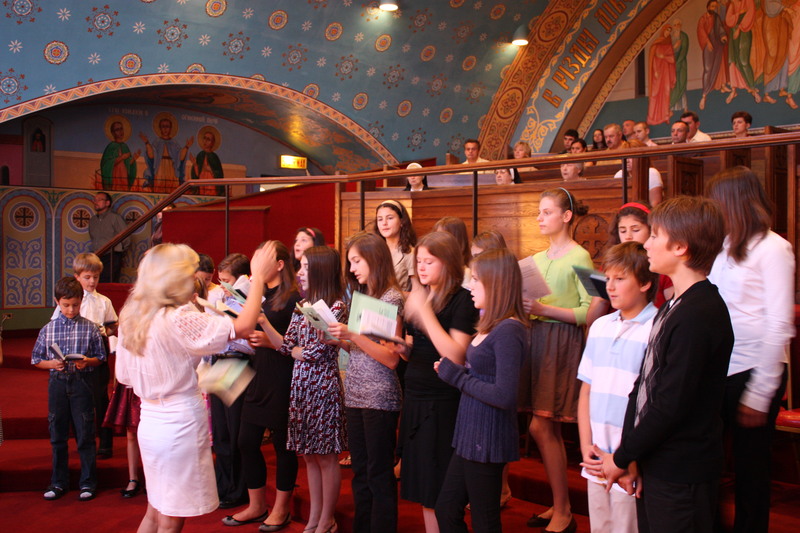 The choir received a special invitation to welcome the President of Ukrain – Viktor Yuschenko and the First Lady when they came to Chicago. They also had the honor to perform for the Big Shoulders Fund Board Meeting at the Chicago Club. Brush Creek Ranch Science Enrichment Program offers once in a lifetime experiences for students. The Brush Creek Ranch Science Camp offers students opportunity to learn by doing: looking for animals tracks while out hiking, discerning the difference between predator and prey by dissecting owl pellets, taking and testing water samples from the Wyoming Mountains, and learning about constellations while stargazing. Students are pushed out of their comfort zones, challenged by activities which include horseback riding, high/low ropes course, and zip lining, while their teachers and ranch staff cheer them on. Engineering Club The engineering process is an important skill set for students in the 21st century. It builds the ability for students to problem solve and think of multiple approaches to situations in which are posed. Students registered in this club will be given opportunities to complete the engineering design process through fun & challenging activities! Kindness Club Students in this club will learn the importance of spreading kindness! At SNCS, it is equally important for our students to be kind and understand the importance of spreading positivity throughout the world. They brainstorm as a group how they can impact the school community and remind everyone to be kind at all times. Expect warm fuzzies! Board Games Galore! Club members learn the rules of different board games and how to successfully strategize a win! Each week features a different board game that will be taught and played during club meetings. Board games range from chess to Monopoly to even fun games like Candyland! Drama Members of drama learn the important skills that are required to put on a full theatre show. This club is offered in two sessions, with a culminating play that is performed for the entire school community. Healthy Cooking is Fun! Students in this club will create fun treats that they will get to enjoy when they get home, and perhaps even show you how to make the edible masterpieces as well! This club is a big hit with our youngest students. Creation Station Club This club is proud be a part of the stay-green movement. In this club your child will learn how to make the most out of recyclable material and create works of art to display proudly throughout the school and to take home to share with family. Crafting Club Students registered in this club will be given the opportunity to use imagination and creative thinking to create products that explore the creative sides of our primary age students.